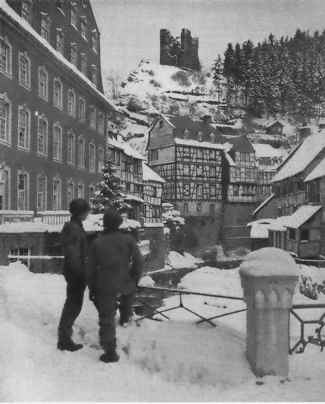 I was assigned to Company F, 60th infantry as a replacement in the first part of September 1944, just after they crossed the Meuse River. As I remember, the ground was quite wet. In some places, the roads were pure mud, like soup, from traffic.
! 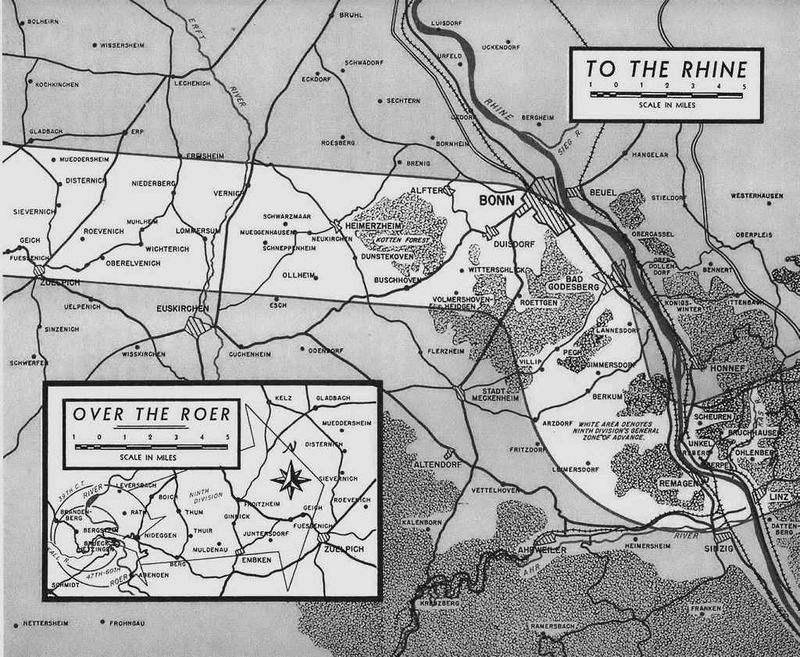 cannot remember the names of some of the towns we were in, although, I can remember Rotgen. If I am not mistaken, we had a Command post in one of the pill boxes there. I believe we went from Rotgen to Monschau. Our first time there (we were there twice), we were being transported by trucks. As we came through a valley, the Germans up in the hills opened up on us with artillery shells. They were hitting on the road bed about three feet behind our truck. The driver stopped the. truck, in fact the whole convoy stopped. Everyone piled out into the ditches for protection. Soon, the command jeep came along. He chewed out the drivers and told us to get loaded up and get the hell out of here. We then proceeded to the top of the hill at Monschau where we detrucked to go into the town. Another outfit also was in town. We came across an American half-track loaded with ammunition and supplies that was burning and exploding as it burned. German snipers were all over in the town. They were also east of town, where they had quite a few pill boxes. From there we went to Germeter. We were held up by a German 88 mm and some pill boxes which we took care of. Ahead of us, across the road, was a plantation of smaller pines approximately fifteen or twenty feet tall and quite thick. Our Lieutenant said this was as far as we could go, so this was where We set up our C.P. Shortly after, artillery started coming in. Suddenly, a tree burst hit and killed one of the guys going into the C.P. (This was when we learned about top cover for our fox holes.) While there, I wrote a letter home to my folks, using a piece of paper out of a dead German's pack. We left this area and were up on a high ridge when the German's counter-attacked. 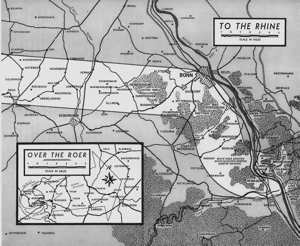 I, being radio man, called in the coordinates given to me, and the attack was broken up. From there, two of us, I and another guy from our squad, were taken by Jeep to a place on the hillside where we could look down into a valley. We were told to go up there, dig in and report in every hour. Our job was to watch for German tanks, which were expected to come through the valley below. We dug our fox holes and I called in. After that, we got the shelling of our lives. After it was over, we both got busy digging our fox holes deeper. Every time I called in, we got shelled again. The German's had us zeroed in. They thought we were an American tank since I was using a 300 radio. The next day it was raining hard. Soon there was some activity in the valley. It was our outfit coming through. We received a call to come down and join them. Artillery shells were coming in as we left our position. When we got there, we dug our fox holes and had water running in. ( Sleeping in something like this was nice to look forward to! ) Seems to me, around that time we were going on rotation to get showers and clean clothes. 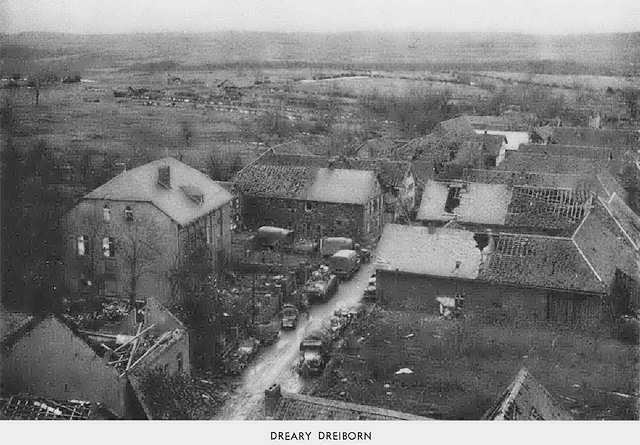 It was in this area that we were relieved by the 99th Infantry for our trip to (Buzz Bomb Alley) Camp Elsenborn for a rest. The first day there, we were in an open field outside of the camp, where we dug our fox holes. Here's where I saw the first Buzz Bomb hit below us. I also saw two vapor trails going up from the horizon like two streaks. I never saw anything travel that fast in my life. It was two V-2's possibly going to England. One night while I was on guard duty, I heard a buzz bomb coming. All at once, the noise stopped and there was a bang, which knocked me down. Soon after, my Sergeant came out to check. He said, "Boy, I thought that one got you." While at camp Elsenborn, we were issued overshoes and gloves. We worked on field problems. After leaving Elsenborn, I think we were at Monschau for a while. My partner and I were put on guard on the top of a hill. There was a road junction where we could look down at the town. After digging in, we were supposed to stop anyone who came up the road. We also had to report any lights that came on in town. Soon three young German boys came up the road with some of their belongings in a bundle which was tied on a stick and hanging over their backs. 8 stopped them and made them put their belongings on the ground. ( We were not allowed to touch things like that since they might be booby trapped. ) These boys were taken to the rear for interrogation. This was during daylight. When it became dark, a light came on in one of the houses. My partner raised his rifle and fired a round at the Bight. St didn't take long to receive an answer. We got the damnedest artillery shelling and I said to him, "don't you ever do that again and give away our position." 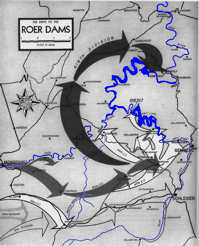 From here, we went to an area around Echtz, where we got ready for our push to the Roer river. We started out for Obergeich. Our tanks got bogged down and didn't move. Artillery and mortar shells were dropping all around the tanks. We didn't stick around too long. We took off without them, crossing a big open field with small arms fire and artillery coming in. We worked our way through town where our C.P. was set up. The next morning, someone said, "Here they come!" I sure figured the Germans were counter attacking. Then someone said, "Hold your fire, they're our troops!" I don't remember how long we were there until orders came down to move out. We started out of Mariaweiler on a narrow road outside of town. A German plane flew over. Everyone hit the ditches and laid down flat as he flew over and dropped a row of bouncing Betties down the center of the road. This was the first time I had ever seen these used. They hit the road bed, jumped up about three feet, and exploded. They were loaded with pellets. They would have cut us down had we not been laying on the ground. After arriving at Eupen, we were on the look out for impostors. (Germans wearing American uniforms.) We were in Eupen for quite a few days. Then we were moved into the woods until the end of December, 1944. 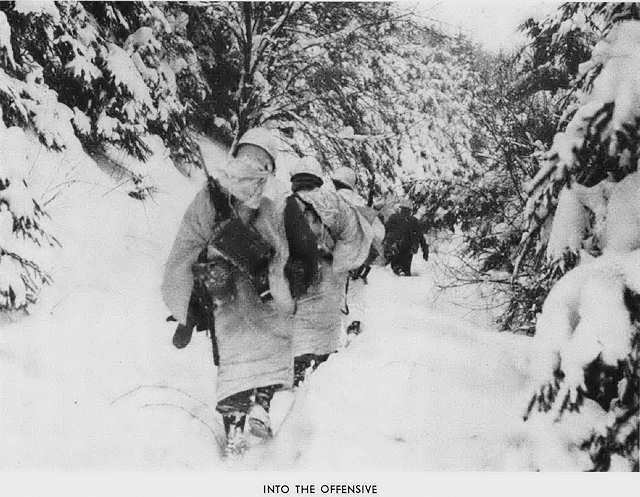 On New Year's day, we went into an open area to set up fighting positions. The forest was in front of us. As we were at work getting our positions ready, three planes came over the tree tops and dipped down six to eight feet above the ground. I can remember my buddy saying, "Boy, the planes are out early this morning." "Yes," I said, "But who's flying them?" One of the planes flew right over our position. When I looked up, I could see the pilot's face clearly. I could have shot him down with my rifle, but I was afraid of giving away our position (plus scared period!). All together, about fifteen or twenty planes followed. The first three all headed to our rear area after the big guns. We could not advance so the orders were, "Empty mess kits returning." (Returning to base.) I left everything in that town, including my rifle, so I could help carry out one of our wounded on a litter. When we came to the edge of town, we ran into small arms fire. We also encountered a problem on the other end of town where the Germans were raising heck with our advance, but that was taken care of, and things settled down. The next attack was at the town of Widdau. Again, we were wearing cook's uniforms. We started out and hit an open field. As we were going across the field, it was snowing quite hard. When we came to the middle of this area, we ran into a German bunker. One German came out talking German. He was carrying something in his helmet. I would say it was urine to dump. When he noticed us right next to him, he crawled back in the bunker. Our squad leader asked them to surrender, but they wouldn't. So he threw a hand grenade in. We kept on going until we came to the edge of Widdau. Here, we came upon a bunch of Germans all lined up and ready to take off. We captured the whole works without firing a shot. Later that day, one of the squad and I were on some errand. We walked right past a machine gun nest and didn't see it. On the way back, we happened to notice it and took three German prisoners. From here, we went into the woods and followed a valley with a small stream. I remember this, because the army was taking water from it. As we worked our way up the stream, we came upon a dead horse and a dead German in this stream. The firing stopped, so we proceeded to the edge of town taking buildings. 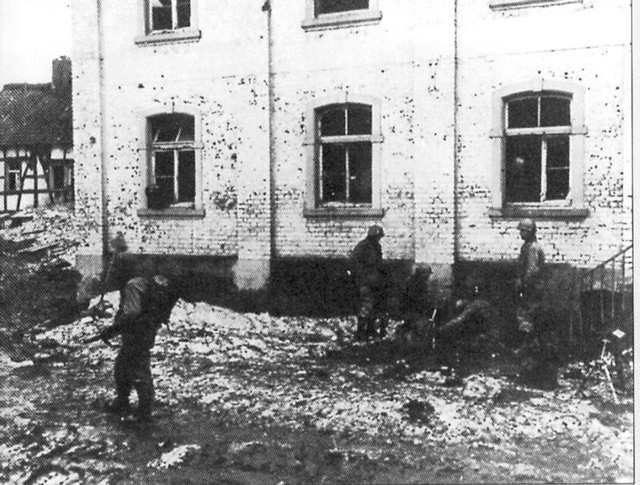 After we had taken a barn, and were inside, a squad of German soldiers came down the street in a single column. Lieutenant Powles hollered, "Halt!" He then fired his Thompson machine gun. They all fell down. (I thought, boy! What shooting! But when he called to them, every one got up!) From here, we went into town where we picked up quite a few soldiers and civilians. After Dreiborn, we headed for the Schwammenauel Dam area. Around this time, artificial moonlight was being used. (Searchlights.) After arriving in the Schwammenauel Dam area, we started our citation award attack. We began in a large open area going about 500 yards. I noticed shell holes in that area. Soon, I heard a, "Cer-chunk, cer-chunk" in the rear. It sounded like mortar were coming in. I got into one of the holes until the shelling stopped. We were there until the tanks could come up, so we could move ahead. As we moved ahead, I saw why we were shelled so bad. There was quite a stock of German ammo, and they were firing a bazooka at us point blank. We came to a building that was quite tall. It looked like a grist mill. We spent some time in that building and found that we were not alone! We had the company of three dead Germans! It seems to me that we moved into the woods around that time to relieve the 82nd Airborne. I remember these guys running around without their helmets on. To me, this was a no-no. I valued my head too much to do that! We finally crossed the Roer River to take the towns of Thum and Nideggen. We worked our way up by using the ditches along the road for concealment. The squad leader and a few men would move ahead to check out the area. When it was clear, they would motion the rest ahead until we got in the town. I remember the town of Muldenau, but I can't remember much about it. I also remember going past a large church which I think was around Cologne. From here, I draw a blank until Remagen bridge. Planes were coming in, trying to knock out the bridge. Anti-aircraft shells were going up and coming down. They would explode as they hit the ground, just like an artillery barrage coming in. Our C.P. was in a large building. I can remember we started out taking a town house by house in the evening. As we worked our way up the line, we came to a garage where we were pinned down. I was on guard outside, when a German came around with a potato masher in his hand. He was ready to throw it into the garage. He was surprised to see me there. I convinced him to give up. I then took him into the garage and went out again on guard duty. I watched our bazooka team fire at a tank, and when the bazooka shell hit, it ran off like water. The tank was zeroed in on the garage that we were in. They gave us an ultimatum, to give up or get blasted out. The squad got together and decided to give up. Everyone got in line, filing out with hands above heads. (I got in line after I had emptied my pockets of all the German trinkets plus a German Luger that were left on the floor of the building.) I was ready to go. I looked to the rear of the garage, and saw someone going out a window. I left the line and followed him out. I had to step up onto the hood of a car to reach the window, and in so doing, I looked into the car. There was a German soldier in it. He had been there the whole while. He was probably giving information on how many of us there were and where we were. After the two of us finally got through the window, the Germans noticed us escaping. Flares went up and mortars started dropping. We ran through and made it back to our lines and went to our C.P. Here, we were interrogated by officers on what had happened back there. I told an officer, "I am not going back up there to fight those tanks with a rifle." That was it for me! They tagged me and I was sent back to Ciney, Belgium for treatment. After spending a couple of weeks there, I was released and headed back up to my unit. I was at Verviers, Belgium when Germany surrendered, and had plenty of points for discharge, I was sent to Reims, France until transportation was available by ship from Antwerp, Belgium. I was discharged on August 7, 1945, After discharge, I could have cared, less about what happened over there. In fact, I tried to forget it. After retiring at the age of sixty-two, I became interested in what had taken place after I had left the company. In 1986, I joined the 9th Infantry Division association and attended my first reunion at Camp Hill, Pennsylvania. There, I met Lieutenant Cliff Painter and a few of the other fellows who helped me refresh my memory and fill in some of the parts that were missing. In 1987, I put an article in the Octofoil asking if anyone could remember what happened to the fellows that were captured on the east side of the Remagen Bridge. I also asked if someone knew the fellow who had gone out of the window ahead of me. We met for the first time in forty-six years in 1991, at our reunion in Milwaukee. This was one of the highlights of my life. In remembrance of Donald E Crass. Donald passed away in 2012. He was 92 (almost 93) years old and is survived by his wife of 64 years Fayme and their 4 children, grandfather of 8 and great-grandfather of 4.